With the advent of easily accessible Magnetic resonance imaging (MRI), the identification of even singular embryological aberrations which usually lie on a rare end of entire spectrum neural tube defects (NTDs) has increased, although the overall incidence is decreasing. Split cord malformations (SCMs) with classic type I (bony spur) and type II (fibrocartilagenous) bands can sometimes be associated with dermoid cysts, teratoma, neurenteric cysts, and lipoma. It depends on what part of endomesenchymal tract differentiates. Here, we describe a case of complex SCM with dermoid cyst splitting the cord. A 4-year-old boy presented with a tuft of hair and small sinus (non-discharging) over the lower back in midline. There was incontinence of urine since 1 week. However, he had no difficulty in walking. MRI scan showed SCM at the L1 level with low lying cord [Figure 1]. A standard laminotomy was carried out. Laminae were not hypertrophied. 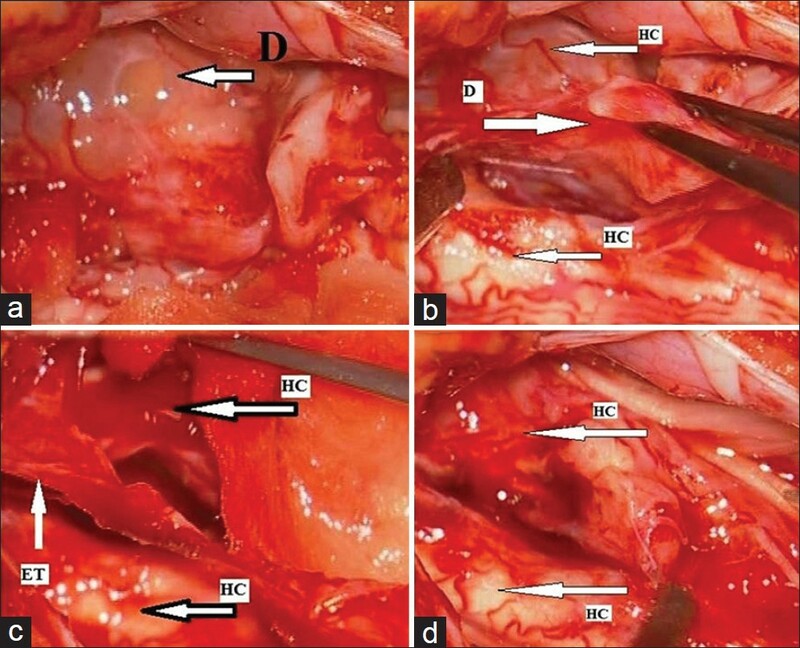 Thin fibrous band was seen as entering the dura through a tiny opening and merging with an intradural cyst. On opening the dura, a thin-walled cyst was seen mushrooming between split cords and a dividing fibrovascular band was seen as stalk of the cyst [Figure 2]. The cyst contained cheesy white material that was confirmed on histopathology as dermoid. Postoperatively the patient did not have any new deficits. On follow-up of 6 months, the patient had become continent. The landmark theory of unified embryogenesis by Pang describes the presence of accessory neurenteric canal as a committal step in the genesis of SCM. Primitive neurenteric canal, which connects the yolk sac and amnion, is an unlikely cause of split cord because it opens into Hensen's node which must lie opposite future coccyx. All split cords are always rostral to the coccyx. This leads to the conceptualization of accessory fistula which joins the endoderm and ectoderm. The mesenchyme surrounding it condenses to form an endomesenchymal tract. Practically, endoderm seldom survives inside spinal cord; thus it is mesenchymal development that further decides the features of midline structures. The formation of endomesenchymal tract early (< post-ovulatory day [POD] 21) or late ( >21 POD) and uninvolvement or involvement of meninx primitiva determine the formation of SCM II or SCM I, respectively. The endomesenchymal tract can be divided into anterior, intermediate, and posterior segments. The persistence of anterior endodermal end can form intestinal duplication, neurenteric cysts. The persistence of intermediate part divides notochord and neural placode. The division of notochord leads to bifid or hemivertebrae, and neural placode leads to hemicords, i.e., SCM. The posterior end persistence leads to superficial lesions such as angiomas, hypertrichosis and/or deeper lesion such as dermal sinus, dermoid cyst or epidermoid cyst. The index case represents a dermoid cyst which was found splitting the spinal cord. The embryological reasoning for such splitting can be explained on the basis of unified theory. This case is unique as it represents a rare occurrence of a classic description given by Pang. 1. Mahapatra AK. Split cord malformation-A study of 300 cases at AIIMS 1990-2006. J Pediatr Neurosci 2011;6:S41-5. 2. Bremer JL. Dorsal intestinal fistula; accessory neurenteric canal; diastematomyelia. AMA Arch Pathol 1952;54:1328. 3. Pang D, Dias MS, Ahab-Barmada M. Split cord malformation: Part I: A unified theory of embryogenesis for double spinal cord malformations. Neurosurgery 1992;31:451-80. 4. Schijman E. Split spinal cord malformations: Report of 22 cases and review of the literature. Childs Nerv Syst 2003;19:96-103. 5. Kumar R, Prakash M. Unusual split cord with neurenteric cyst and cerebellar heterotopia over spinal cord. Childs Nerv Syst 2007;23:243-7. 6. Uzüm N, Dursun A, Baykaner K, Kurt G. Split-cord malformation and tethered cord associated with immature teratoma. Childs Nerv Syst 2005;21:77-80.